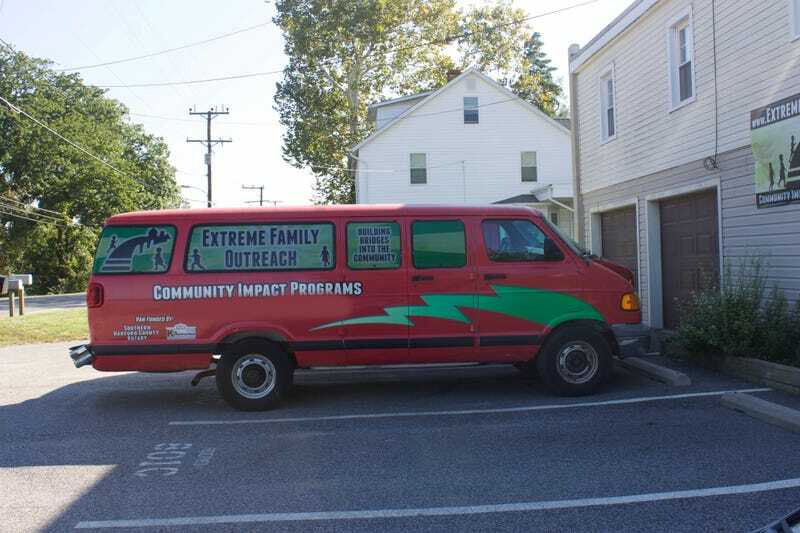 This week’s church van is a third generation Dodge Ram Van “EXTREME” edition. This isn’t a church van exactly, but it definitely performs church van-like activities. Third-generation Ram Vans are one of the quintessential vans for hauling large amounts of people or things when you are on a budget. They are almost disturbingly cheap and can be found for next to nothing on the internet or just the side of the road. I’m not entirely convinced that Dodge actually sold any of these vans new; the only way to buy one might have been through eBay for $500. This specific one is a bit of a mystery, as I have no idea what “EXTREME FAMILY OUTREACH” is supposed to mean; I doubt they take kids sky-diving or snowboarding after school, though. The Dodge is also decked out with a Scooby-Doo picture on the back and eyes on the hood. Similarly perplexing is the Mitsubishi Lancer wagon that’s forever parked next to these vans. I’ve driven past this place for years and it has never moved. Maybe the “EXTREME” pertains to some off-road rallying?